According to Dickipedia, a 'gunfighter' is a person who is willing to commit actual bodily harm against a hand-held munition of some description. Well, it's either that, or else it's somebody you'll get to see in this 87 minute movie made in 1947. 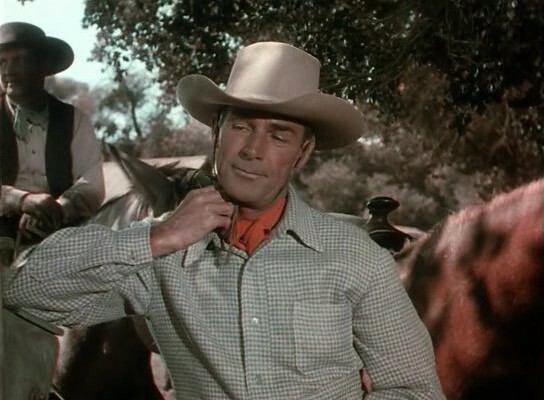 It was Directed by George Waggner, and Starring: Randolph Scott, Barbara Britton, Bruce Cabot, with Charley Grapewin. 'That's it!' says Brazos Kane after shooting a man down in self-defense. 'I've had enough of being a gunslinger' he continues, 'I'm going to hang up my holster, and live the rest of my life as a rancher with my good old friend, Bob Tyrrell'. But no. He doesn't. Bob is dead you see. As dead as Dillinger. Shot full of holes' and left to rot upon his very own doorstep. Plus to make matters even worse for the venerable Mister Kane, he almost gets himself lynched when he then unveils this dreadful news to the local Sheriff. Buy hey! Don't you worry your pretty little heads off, folks! Thanks to that nice-looking gal who catches Kane's sparkly blue eyes, eventually, he managed to clear his good name, and rests up for a short while with his other good old friend, Rancher Inskip (Charley Grapewin). Huh? What's that you say? Who is this nice-looking gal I'm refereeing too? Well, take a guess. Do you think it would be the local gal, Jane Banner (Dorothy Hart)? Who's too hung up on the mastermind behind this heinous act to know any better! Or would it be her similar looking sister, Bess Banner (Barbara Britton)? 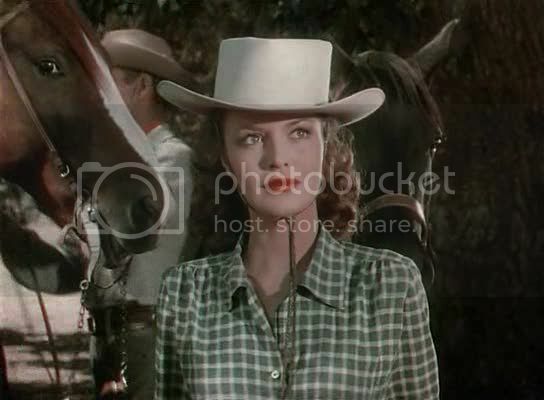 Who falls for Kane big time, despite cottoning on that her sister's feller, Bard Macky (Bruce Cabot), is involved with the aforementioned crime as well! Yep. That's correct. That is the sister I'm referring too, folks. A very cute looking sister I might add, who patiently waits in the wings while Kane does his best to figure out who popped Bob's clogs in the first place. Still. I suppose that is why what next transpires all shoots a blank when a revelation is ultimately revealed. As two sisters bicker - a friend needs a vicar - a gunslinger takes out his gun - and as the day draws to an end, two lovers trot off into the setting sun. Now to be completely honest with you, folks, I'm not entirely sure if I liked watching 'Gunslinger' or not. On the one hand I really enjoyed the cinematic art direction and the anti-gun message behind this movie. Whilst, on the other hand, I wasn't too keen on the way the overall story was structured, or how some of the actor's performed on screen either. Alright. I know that this is a very old film, and that back in the day the acting style was much more wooden than I'm used to, because the actors involved didn't have enough time to flesh out their respective roles and motives. But then again, even though this fact does absolve the acting part of the equation, what it doesn't do, is explain away why the structure of this tale was so mumbled in tone. Listen, I understood that this adventure was about a gunslinger who wanted to give up his gun to live the wholesome life. That's a given. I also understood that the message behind this movie was about how might doesn't equal right. Yet, for the life of me, why where these two earnest plot-points conveyed in such a manner, that it took me the entire film to realize this is what it was all about? I mean, one minute Randal's character was getting shot at and then lynched. The next minute he was wooing one of the girls for some information. After that there was a bit more action and plot. Then there was a segway were Randy taught 'Young John' how to use a gun plus a comedy skit. More wooing. More fighting. Woo. Fight. Woo. Fight. Blah-Blah-Blah. Yadda-Yadaa-Yadda! Booom! Game over. Now do you see what I'm driving at, folks? The core of this film was fine, as it did tell a tale that was well worth telling. What I had a problem with was the flimflam pace of the conceptual narrative. Cause even though this movie was slow in tone, the tale in itself was a long time coming due to the way plot-points were frantically woven into its overall tapestry. Anyway. That's enough of that methinks. Because I'd say that this was a pretty good time for some filmic-facts. (1) 'Columbia Pictures' first released this production on the very same day that the American songwriter, Walter Donaldson, passed away -- the 15th of July, 1947. (2) Loosely translated, this project was entitled 'Avengers without Weapons' in Austria; 'March to Burn' in Finland; and in the United Kingdom it was given the name, 'The Assassin'. (3) The majority of this movie was shot on location throughout the two American states of California and Arizona. In Arizona you might notice Sedona, whist in California you might notice Andy Jauregui Ranch, located in Placerita Canyon Road; Monogram Ranch, located in Oak Creek Avenue; and Vasquez Rocks Natural Area Park, located in West Escondido Canyon Road. (5) This film was based on Zane Grey's sequel to the 'Knights of the Range' -- entitled 'Twin Sombreros' -- and then adapted from this original novel by 'The Searchers' author, Alan Le May. (6) Now if you took any notice of my previous fact, you might also like to know that the author of the original novel, Zane Grey, has had one hundred and two films, two television episodes, and a television series, based upon his novels and short stories. (7) Excerpts from this adventure can be seen in Robert Altman's 1957 documentary about James Dean, entitled, 'The James Dean Story'. 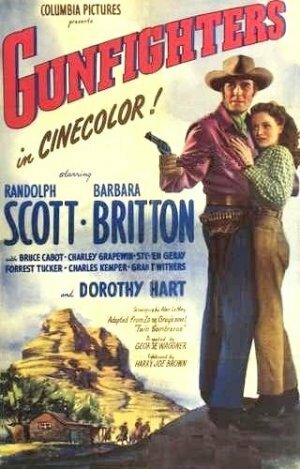 (8) After this flick shot its load, both Randolph Scott and Barbara Britton starred in 'Albuquerque', whilst Bruce Cabot starred in 'The Gallant Legion'. 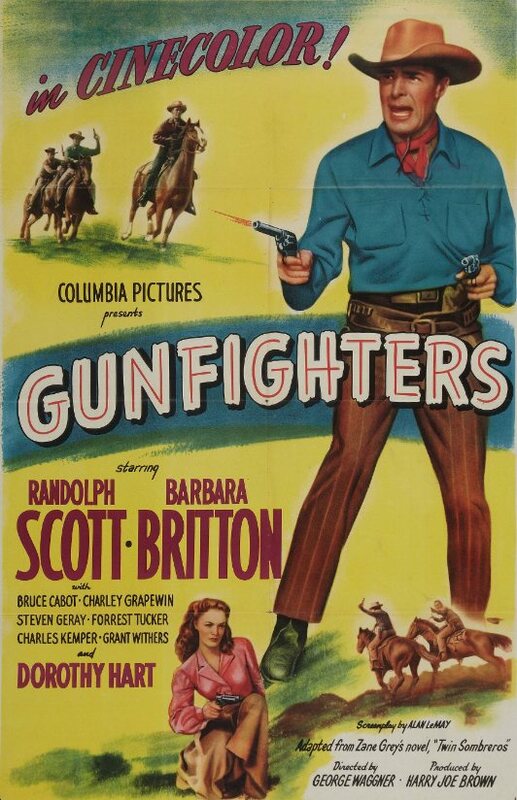 (9) George Waggner, who directed this Western, also directed such television classics as 'Maverick', 'Cheyenne', 'The Green Hornet', 'Man from U.N.C.L.E', and the 1966 version of 'Batman'. Overall, I would have to say 'Gunfighter' was a pretty alright film. The acting was standard for its time. The message and the cinematic style were on point. And the only thing that let it down would be how the central narrative had little to no focus.